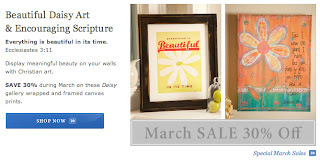 Inspiring Ideas with artist Jeanne Winters: Daisy Art on Sale! They're featuring one of my art prints - "Everything Is Beautiful In Its Time" on sale in March for 30% off! Available in framed canvas or gallery wrapped canvas! Visit DaySpring.com to get yours - use my affiliate link below for FREE SHIPPING too!!! WooHoo!! What a great idea! I loved those when I was little. Time to start making them again!